We are proud to announce that the conference website, created by the University of Strathclyde, is now live and open for registration. We are inviting you to sign up now for this 3rd International Conference in Glasgow. The theme of the 2019 conference is Emotion-Focused Therapy: The Growth Edge, emphasising exciting developments which see EFT practitioners from all over the world extending the approach to new client populations, new modes of delivery, and new generations of therapists. 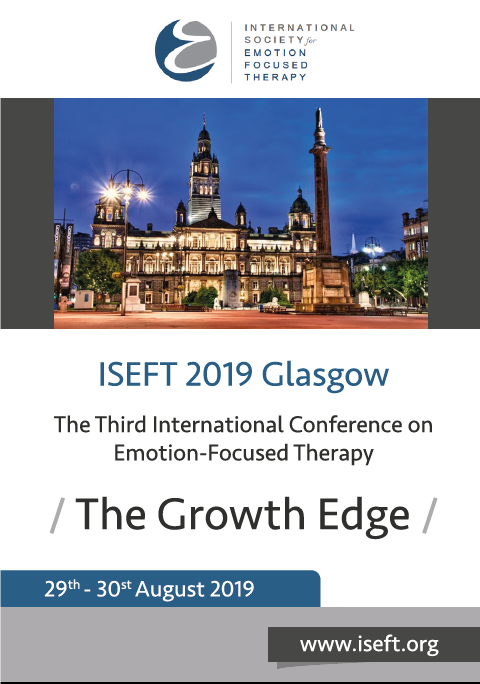 Building on the success of the previous two ISEFT conferences, ISEFT 2019 Glasgow will feature both the most well-known figures of EFT world and emerging voices representing the next generation of EFT practitioners, all coming together to share the latest ideas about EFT theory, practice and research. Registration for the conference is now open, with the early bird fee due to end on 31st May. The programme will feature panels, individual papers, posters, open discussions and workshops. ISEFT 2019 Glasgow will take place in the new Technological Innovation Centre at the University of Strathclyde in the classic Merchant City area within Glasgow City Centre, with easy access by air and rail links. Visit the conference website for more detailed information. Student On-Campus Accommodation - We have a limited number of ensuite rooms available on-campus on a room only basis. Each room costs £46.50 per night and can be booked via our online shop when registering for the conference. Local Hotels - For hotels local to the conference venue please find more information here.